Here, Bean discusses the ways in which Utica Italians built a surprisingly rich community life and how the immigrant experience fostered the development of ethnic identity among them. Haverford College: Why did you choose to write specifically about the Italian-American community in Utica? Philip Bean: Utica is interesting for a number of reasons. Although very few studies of Italian immigration have been based on communities, like Utica, with fewer than 100,000 inhabitants, nearly half of all Italian immigrants in the U.S. lived in such places in 1910. 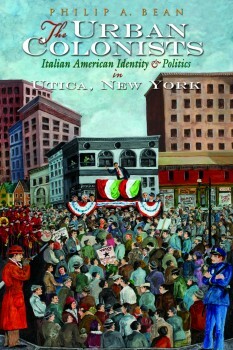 Italians constituted a higher percentage of the foreign-born and overall population of Utica than they did in New York City, Chicago, or Philadelphia. Utica also offers unusually good sources on which to base a study of this sort. In addition, my mother is from a local Italian American family, and I grew up in an environment strongly influenced by that heritage. HC: Why did Italians settle specifically in Utica in the 19th century? PB: Many of the first Italians came as seasonal migratory laborers from New York City to lay railroad lines in the 1870s and 1880s. Increasing numbers then began to settle permanently after finding opportunities in local textile and garment factories. Many also worked in construction, as Utica grew more rapidly than Manhattan in 1890-1920 and innumerable homes and commercial structures were built locally in that period. HC: In the book, you discuss the evolution of Italian identity. How did this process occur? PB: Many immigrants did not think of themselves as“Italians” when they first arrived in the U.S., and they tended instead to identify with people from their hometowns and home regions in southern Italy. Over time, however, something happened in urban America that had proven much more elusive in southern Italy: Former peasants began to embrace Italian identity. Workplace struggles, anti-Italian sentiment, commercial forces, and even religion helped to foster this process, but so did the interplay between electoral politics and the ethnic nationalist movement. Indeed, ethnic politicians and nationalist enthusiasts reinforced each other: Both appealed to their neighbors as Italians, and the machine made the advantages of Italian solidarity particularly tangible. In this way, Italians became unified not only from the perspective of identity, but also as a regionally significant Democratic voting bloc in the 1920s. HC: Recent news articles have shown Utica to be a place of acceptance and tolerance for the Muslim community. What makes the town welcoming to different ethnicities and faiths? PB: Today's tolerance arises, in part, from the recognition that this city is being rejuvenated by new arrivals, notably Bosnian Muslims who have brought new life to once-declining neighborhoods. They have, for instance, transformed an endangered former Methodist church next to city hall into a mosque with the support of Utica's Italian American mayor and many local residents. I would also like to think that at least some people who object, correctly, to the way their ancestors were mistreated by American society in the 20th century are determined not to replicate the mistakes of the past. Time will tell whether I'm correct in so thinking.